Architect Nicholas Socrates‘ vision of how the bay could look if a beach was constructed next to Mermaid Quay. It also shows the basin at Roald Dahl Plaza transformed into a lido, with people swimming as the Wales Millennium Centre looms. Nicholas said: “Barcelona is a model city. The most famous beach in Barcelona is Barceloneta stretching for three miles. It is an artificial beach but it is marvellous and beautiful! During summer, the beach is always crowded with locals and tourists. “Barcelona’s waterfront was originally an old industrial area of vacant warehouses, factories, and rail yards, furthermore, it was polluted by vast landfill sites. Water quality is key to the success of the proposed Cardiff Bay beach. Nicholas said: “The water within the barrage is supplied from the river Taff and the river Ely with a small amount of salt-water ingress from the main locks whilst allowing boats to pass through. “Thanks to the installed oxygenation systems in the bay the quality of the freshwater is greatly improved. Greater connectivity between Cardiff Bay and the city is crucial. It’s London but not as we know it. 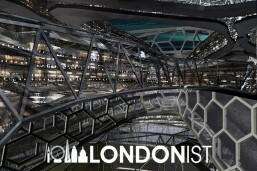 This artist’s impressions of a future London was a shortlisted winner of a competition launched by estate agent Cluttons and property news magazine Estate Gazette. 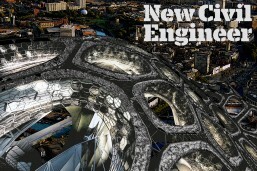 Will the metropolis of tomorrow be a land of aquacities, sky gardens and huge alien-looking domes?